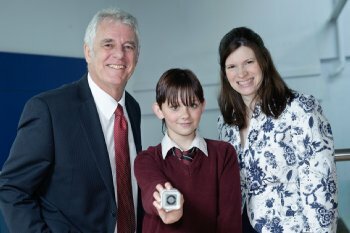 Secondary school pupils in Coleraine have had ‘hands on’ experience of Geographic Information Systems (GIS), thanks to iMap, an innovative project by the Schools of Environmental Sciences and Education at the University of Ulster. GIS, which has recently been introduced into the GCSE Geography syllabus, can be used to analyse, manage and present all types of geographical data to give a better understanding of the world about us. Geography lecturer, Dr Paul McKenzie explained: “It can be used to combine information from a range of different sources to enhance our understanding of how and where things happen, from earthquake modelling in Sumatra to finding the best location for a new local supermarket. “The aim of iMap was to introduce GIS to Year 9 pupils and get them to understand its relevance by showing them some of the real life applications of digital maps.” Around fifty pupils from St Joseph’s College and Coleraine College completed the project with the help of both Schools in the University which are based on the Coleraine campus. They were divided into groups and each group produced a poster of their GIS investigation into the impact of flooding in the centre of Coleraine – just one example of how digital maps can be used in real world situations. iPod shuffles were presented for the best poster, the best team and also for the best individual contribution. Dr Stephen Roulston led the design of the learning resources with a team of PGCE Geography students. The learning resources were then complemented with geographic data and manuals prepared by GIS students from the School of Environmental Sciences. Dr Sally Cook said: “The iMap project gives school children an opportunity to work together on an in-depth GIS project and investigate the strengths of Geographic Information. The project was funded through Access & Distributed Learning at the University of Ulster through the Outreach Programme. For more information about the iMap project please contact Dr Paul McKenzie (sjp.mckenzie@ulster.ac.uk). Caption Leona Parry, St Joseph’s College, winner of the Individual prize at the GIS workshop for schools held at Coleraine campus of University of Ulster with Professor Keith Day (Head of School of Environmental Sciences) and Dr Aideen Hunter (School of Education).